Official Le Coq Sportif Everton 09/10 DONOVAN Home Soccer Jersey! 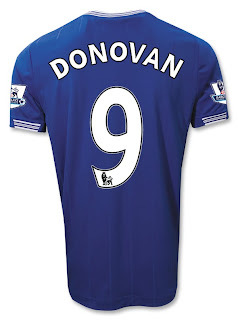 Donovan will surely shine at Goodison Park and help the Toffees move up in the Premier League table, and this is the shirt he will defend! This is the first Le Coq Sportif shirt, with the white 'v', reminiscent of the kit worn by the likes of Graeme Sharp, Kevin Ratcliffe, Peter Reid and Andy Gray almost 25 years ago, as the Toffees powered to league and European success in 1984/85. Ours features DONOVAN 9 on the back, with authentic Barclays Premier League letters/numbers and league patches on both sleeves.